Alcohol is almost as calorie dense as fat. Pure alcohol has 7 calories per gram (fat has 9 calories per gram). However most beers also have a high amount of carbohydrate (4 calories per gram). Alcohol suppresses the bodies ability to burn fat, so if you are trying to lose fat, consuming alcohol is counter-productive. 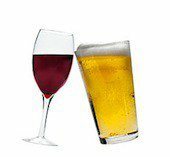 If you drink, drink in moderation and aim for a light beer or a small glass of red wine. See a full range of Alcoholic Beverages.